Hello there, today I am delighted to be taking part in the Spellbinders 2018 February Blog Hop. 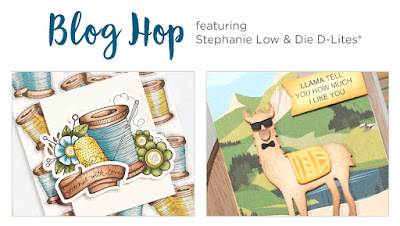 Spellbinders have had two new releases in the last couple of days - Handmade by Stephanie Low and Die D-Lites (Feb) and we are showcasing those today. If you are following along in the hop, you should have arrived here from Erum, but if you get lost along the way, I have the full list of hoppers below. For my projects today. I am using the new Die D-Lites (Feb) range. I wanted to show four different ways to use the dies. These ways are nothing ground breaking, but it is nice to revisit different ways of using dies. My first way is to use coloured cardstock and felt, which is probably the most common way of using dies. How adorable is the new Die D-Lites Build A Panda Etched Dies set? 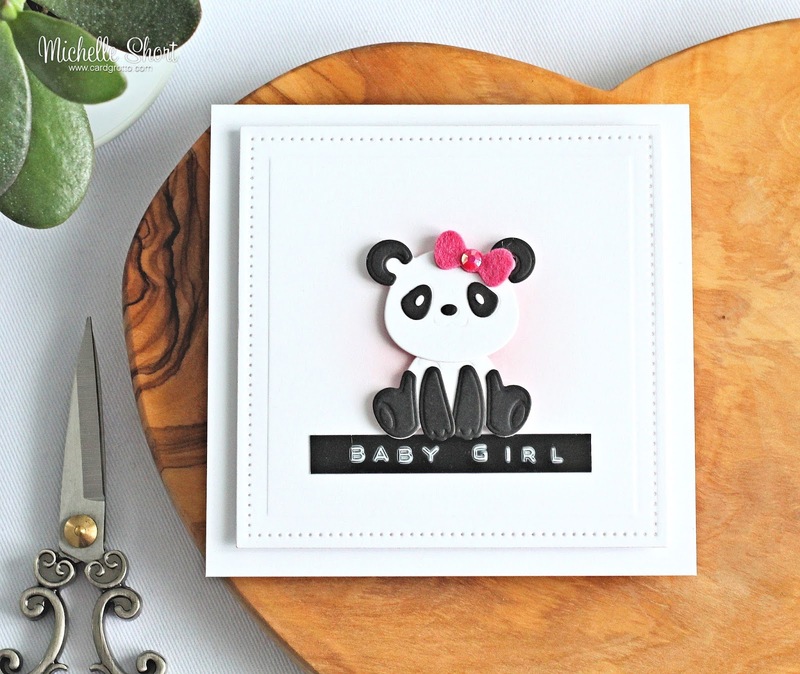 I thought I would make the panda into a girl and she would be perfect for a baby girl card. 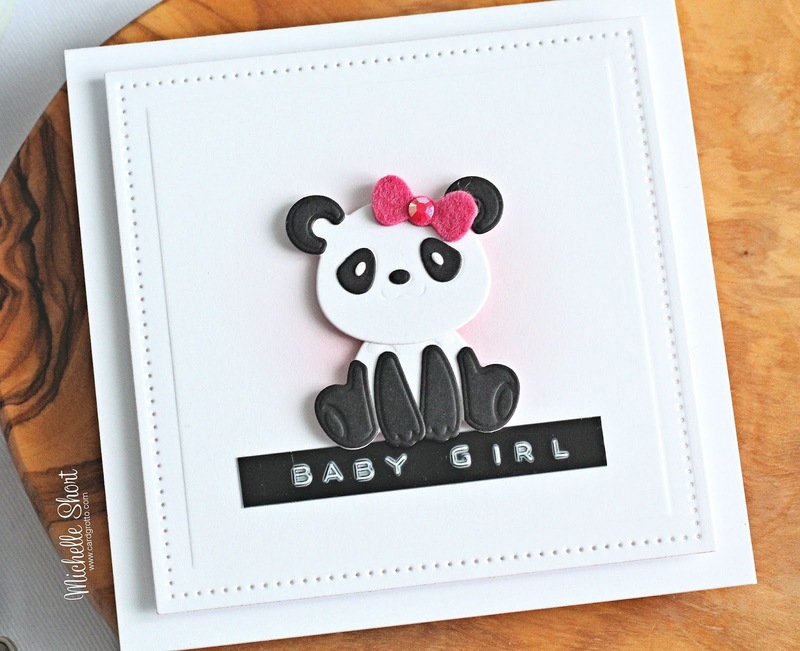 I cut the panda using white and black cardstock, as well as a little pink felt for the bow on her hair (or is it fur?!). She was simply added to a white base cut using the Nestabilities Pierced Squares Dies. I added soft ink blending behind her with Victorian Velvet Distress Ink, to help her pop. The sentiment is made using a Dymo Embossing Label Maker. The panel was then added to a white 4.25" x 4.25" card base with foam tape. My second card uses the new Die D-Lites Build A Terrarium Etched Dies. I decided to die cut these using white cardstock and added colour to them with Copic Markers. I think this adds a lot of dimension to the die cuts. I also added highlights to the cacti with a white gel pen. To create the card, I cut the larger of the bell jar terrarium piece directly on the white card base, and a white cardstock panel. I added acetate behind the panel piece and then added this on to the card base. This sandwiches the acetate between the card base and the panel on top. The cacti were then added on top. The sentiment was again made with the Dymo Embossing Label Maker. 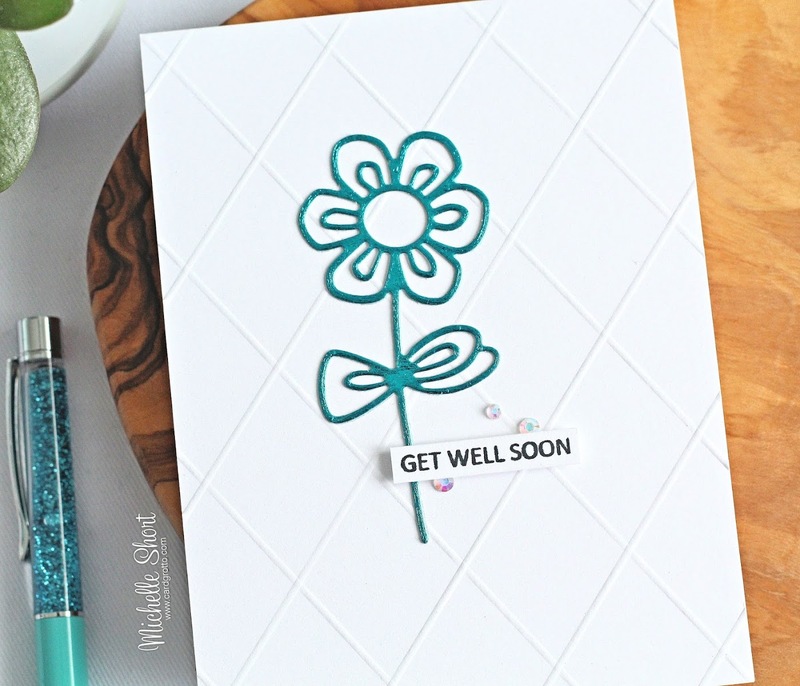 My third card uses the Die D-Lites Sketched Blooms 2 Etched Dies. For this card, I thought I would die cut using foil. I added Deco Foil to some adhesive sheet, removed the top plastic sheet from the foil and ran this through the Platinum 6 Die Cutting Machine. This gives a bit of textured, slightly duller look to the foil. In the video, I show how you can also get a shiny look, if that is what you are going for. I took a white A2 card base and scored lines on to it using a score board and bone folder. This gives some nice detail without adding any extra bulk or taking away the focus from the die cut. I added the die cut flower on top with liquid glue. I stamped the sentiment from the Clearly Besotted Tiny Type set on to white cardstock with black ink and cut this in to a strip. This was added to the card with foam tape. To finish off, I added a few Iridescent Jewels. 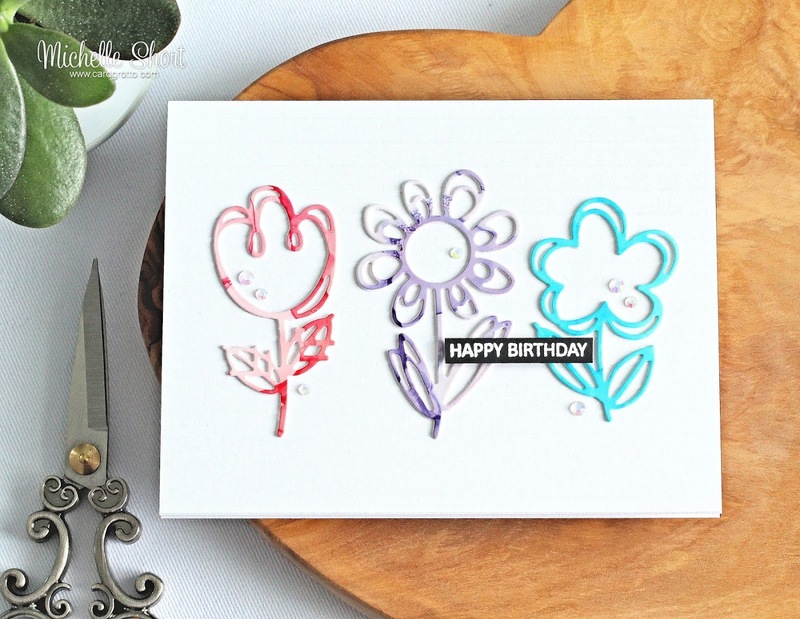 My final card uses the new Die D-Lites Sketch Blooms Etched Dies. For this card, I thought I would use up some of the scraps that I have. I keep all of the background pieces that I make and so I thought die cutting from them would be perfect. In this case, I had three pieces of backgrounds that I made using Copic Refills. If you are interested in how I made the purple piece, you can find the information HERE. I die cut the flowers again from white cardstock and layered these behind the alcohol ink pieces (to give extra stability). I took a white card base and scored horizontal lines on to this using a score board and bone folder. Sadly this does not show up in the photos, bit it does add nice detail in real life. The flowers were added on top with liquid glue. I stamped the sentiment from the Clearly Besotted Tiny Type stamp set using Versamark Ink, on to black cardstock. I applied white embossing powder and heat set. This was cut in to as strip and added to the card with foam tape. the card was finished off with Iridescent Jewels. Here are the links to what I have used on the card and in the video. Affiliate links are used on some products. This means that if you make a purchase after clicking on my link, I receive a small commission with no extra cost to you. I truly appreciate your support when using these links. Please click on the logo below the product to shop at your favourite store. Products marked with an asterisk (*) were kindly sent to me to use. 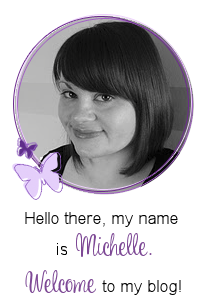 Michelle Short - you are here! To celebrate this release, Spellbinders is giving away a $50 gift certificate to THREE lucky winners. Please leave a comment on the Spellbinders blog by Wednesday, February 21st at 11.59 pm EDT for a chance to win. The winners will be announced in the blog hop post on the Spellbinders blog the following day. But that is not all! I also have a $25 gift certificate to give away to Spellbinders. To enter, just leave a comment on this blog by 20th February 11am EST/4pm GMT. I will announce the winner shortly afterwards. I am the last on the hop but if you missed any of the stops, please do go back and have a look at the inspiration. Thank you so much fro visiting me today. I hope you have a great day! Wonderful projects. I love the sketched florals in this release. Clean, simple and perfectly fabulous! I love that terrarium effect you created! Its brilliant and I've never seen it done like that anywhere before. Gorgeous cards! Beautiful cards. 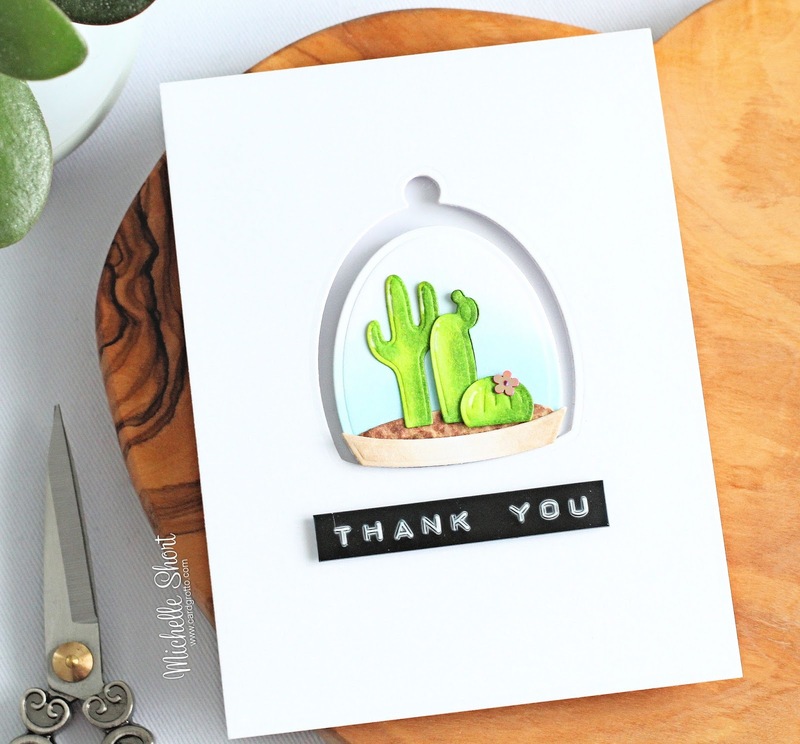 Thanks for sharing your die cutting ideas. Very pretty! Love these dies! I enjoyed all, but fell in love with the little Panda. She is such a doll! Thanks for sharing. I'm loving the little terrarium set! I love you clean and simple designs. So cute! Clean and simple--but not that simple--quite clever, with the light pink background and the cut outs--outstanding! I love the clean look to all these sweet creations! Love the felt accents! I need to do this more!!! Adorable cards!!! They saved the best for last! I just love the clean and simple cards you have created. But that panda! oh my! It is going in my shopping cart. From birthday cards to baby cards, it is so cute and totally irresistible. LOVE!!! Especially the clean and minimalist look! really sweet and cute cards!!! Awesome cards! I love the scored background on the third card and the panda card is adorable! I especially love the Build A Terrarium Card and die set! It is definitely at the top of my wishlist! TFS! This was a fun blog hop and your cards made it worth while to travel to the end. thanks for the inspiration! Your cards are lovely; simple, clean and fantastic. 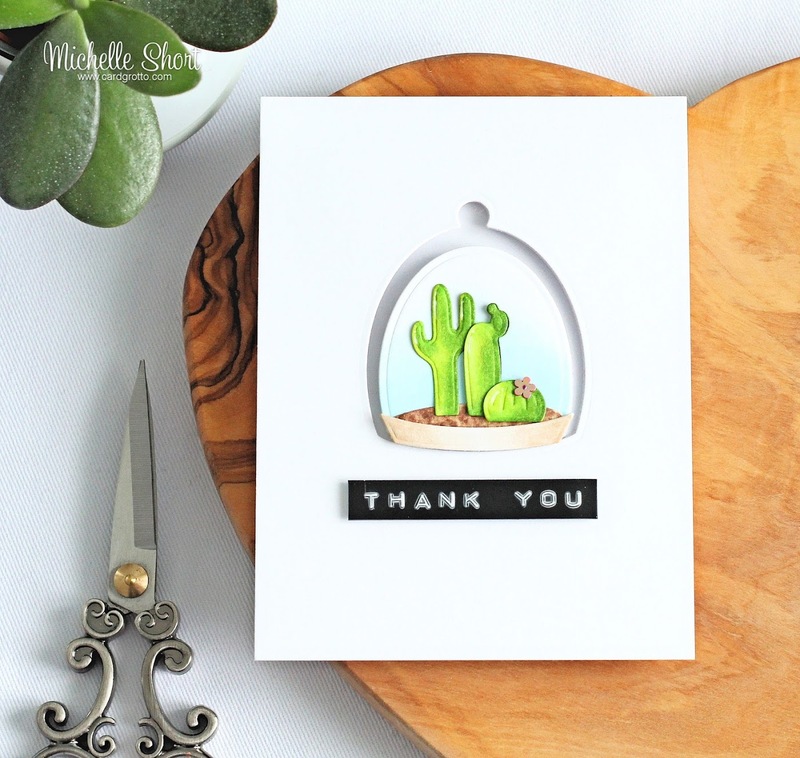 I especially liked the cactus card with the cutout. Thanks for the inspiration. Thanks for the tutorial on using dies in different ways. your cards are all adorable but that sweet panda with her felt bow is my favorite. Thank you for all the pictures and instructions for all the great cards. Also thank you so much for the video as well. It's so nice to get different ideas of how to cut the dies. Your inspirations are greatly appreciated. Thank you!!! Cute variety of cards you created. These are SO sweet! Love that baby girl panda! And the fab terrarium!! Hi, I just LOVED your cards, they were sooo adorable. This is a great release. Thanks for sharing. Your cards are adorable. Love the little panda. Thanks! These are all fabulous Michelle, you did an amazing job showing so many ways to use these awesome dies. Thanks so much for sharing your ideas. Your cards are fantastic. Love the adorable panda. Four fabulous cards! I can't help but smile when I see that sweet panda. Thanks for the awesome inspiration! Very cute. Love the foiling idea! Amazing cards! I love the panda, so cute! What awesome cards! Love the colors and details on each one! The panda is absolutely adorable! Love that terrarium too! Wow...lovely cards with a nice informative video...thanks for sharing!! Aww.. Love your CAS cards..so beautiful ..Thanks for sharing. Love the terrarium card. Such a simple but wonderful idea. Thank you for sharing. Cute, cute cards!! That little pands is just darling! I love the creativity of these cards! Wonderful cards! I really like the crispness and uncluttered look of the dies directly on the cards. Beautiful cards, Love the floral die cut cards. AWESOME. Love them all, especially the terrarium! Really considering learning to quill, looks like a really fun project. Thank you for sharing! Love your cards! Thank you for the inspiration! Simply clean cards that are beautiful! 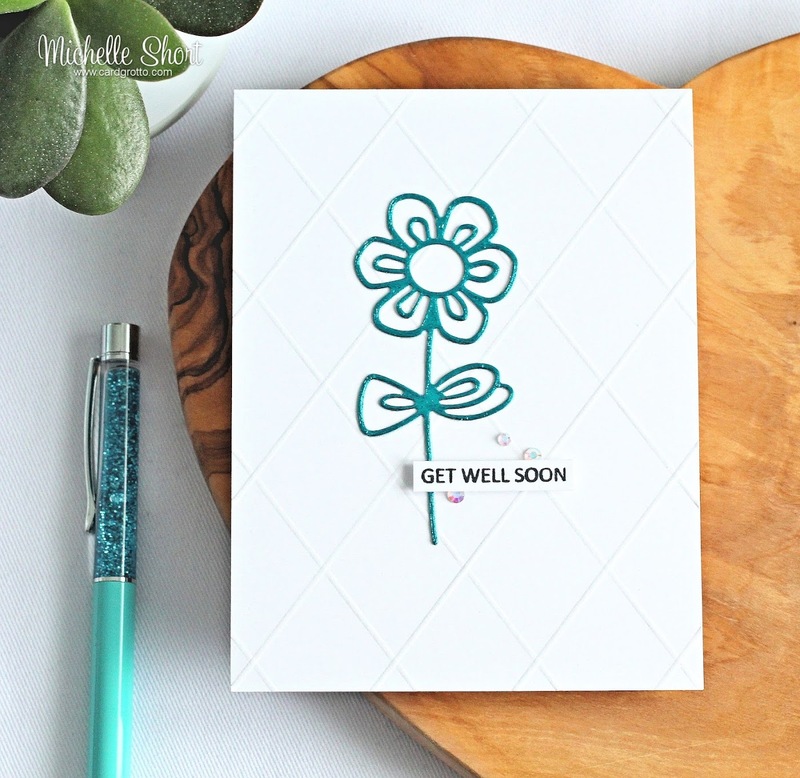 Cute cards and great ideas for using our dies!! Thanks for so many ideas for using dies. These are really beautiful! My favorite is the second card. All of your cards are so awesome. Thanks for sharing your wonderful talent. This release is packed full of goodness. I love this cactus under glass. Plus the food set is really cute. Thanks for your inspiration. 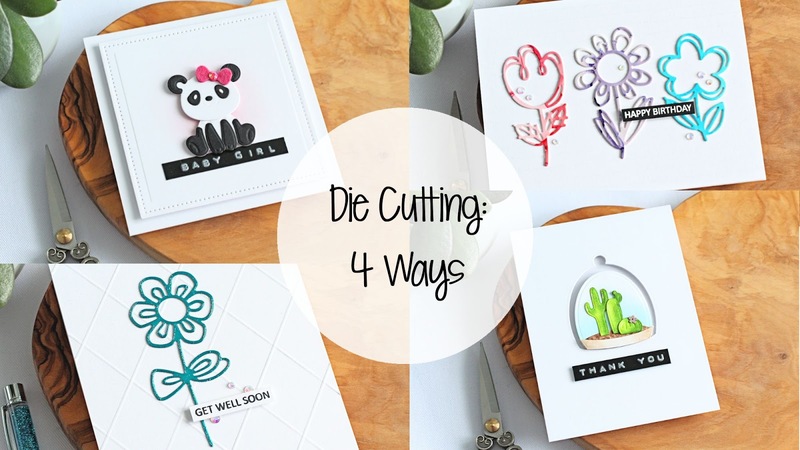 Thanks for the great die cutting ideas - especially the one using the foil. Love the simplicity of your pretty cards. Thanks for the ideas. All the cards look super. Your cards are lovely and hard to pick a favorite. I love all of the new February release. These will be so much fun to create with. Great cards, thanks for the inspiration! Wow!! These are super adorable fantastic CAS cards!! Love them all!! Great cards! I like that they're so clean in the design aspect. I was already crazy about the pandas,but now I want them even more! Thanks for sharing! Your cards are soo adorable!! Great ideas! Simple, stunning, perfection. I know I'm too late for the giveaway, but I wanted you to know I still came over to support and check out your blog. I really like that you allowed the die cuts to be the true focal point in each of your cards. Well done. Oh my goodness ! This little panda with its pink bow !!!! Your cards are wonderful. 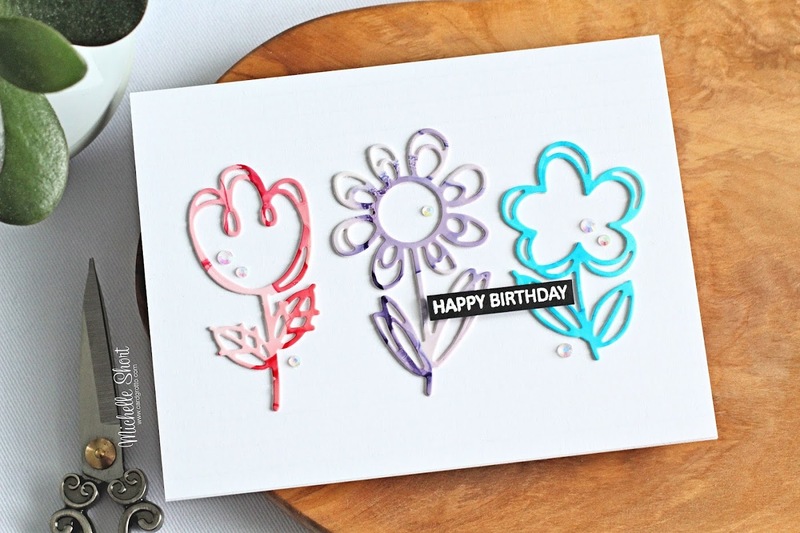 I like the simplicity of the flower card. I think sometimes we over do it and it takes away from our cards. So I think with the flowers you were able to show how they can stand on their own. Thanks for sharing. I truly appreciate how your variety of cards and the video! 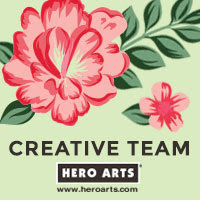 Thanks for your creativity and work! You have shown that clean and simple cards don't have to be boring, Cute cards.